Here is a link to my recent interview on Photokina TV. The topic was the release of Datacolor’s new SpyderCAPTURE PRO bundle. The response to the new bundle, and to Datacolor’s Capture Color Workflow was very positive at the show. If you are interested in learning more about SpyderCAPTURE PRO, click on the video link above, or see the Product Page at Datacolor.com. Its been a bit over six months since I started this blog. In the last week, with Photokina news, and with incoming traffic from such sites as ZDNet, Daring Fireball, DPReview, Luminous Landscape, Extreme Tech, NorthLight Images, and MacRumors (all of those just today, actually), I’ve watched the total page views of the blog creep up towards 100,000. Today is the day that the odometer rolled over, to borrow an automotive phrase. I have very much enjoyed the interaction and connections that this blog has provided, and have settled down to a less frequent, but hopefully useful, schedule of posting, as my time is increasingly taken up by the Datacolor SpyderBLOG, book editing and translations, and other tasks. Thanks for being part of this blog, I hope to continue offering useful information, as the fields of photography and digital technology continue to grow and change. 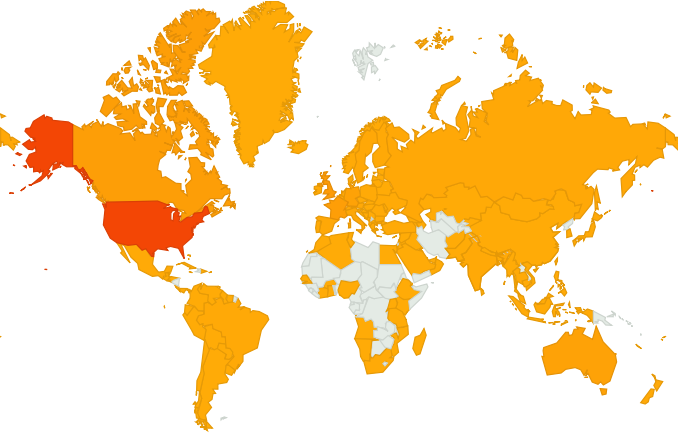 Map of countries accessing CDTobie’s Photo Blog in it’s first six months. Here’s an update to the list of cameras which offer auto-focus micro-adjustment functions. One reason this is important is the ability to adjust these cameras using auto-focus targets such as Datacolor’s SpyderLensCal. The latest Canon models actually allow calibration at both ends of the zoom range of zoom lenses. Keep in mind that a tool like LensCal can check the focus on most any camera, but it can only be adjusted by the user if it offers auto-focus adjustment in the camera firmware. Other camera/lens combinations that are clearly out of auto-focus would need to be sent in for adjustment. Note: There has been quite a discussion on the Nikon D600, with major reviewers claiming it does not offer micro-focus adjustment, and others stating that it does. I have added it to this list based on Nikon’s own specs. The Sony SLT-A99 has also been added, as suggested by a reader, and confirmed in a couple of major reviews. That’s right; kill me now… It doesn’t get any better than this. John Gruber linked to my Blog from Daring Fireball. That may not be quite like having Eric Clapton comment on one of my guitar riffs, but in the Mac Blogosphere, it’s as close as it gets. Thanks, John, for making my day. Photographers have long understood that the most important element in controlling their color is display calibration. And those that are serious about making their own prints also understand the value of custom printer profiles in getting the best results and reducing trial-and-error test prints. But many photographers are only recently becoming aware of capture calibration. Datacolor’s new SpyderCAPTURE PRO product is designed with this new interest in capture calibration in mind. Photographers have been using ICC profiles for their displays and printers for many years. But their early attempts at camera calibration using ICC profiles were often unsatisfying. When color management customers would ask me about capture calibration, that was the term they originally used: Camera ICC profile. But ICC profiles are not ideal for many types of capture calibration, since they build a single light source assumption into the profile, rendering it invalid for most images. In order to use ICC profiles for camera calibration, a new profile must be made for each and every lighting condition, and many situations do not allow for the care appropriate for shooting a color target to use for camera calibration. To further complicate matters, when customers would show me images that they assumed a camera profile would “fix”; these images most often had white balance and exposure issues. This resulted in the first capture product from Datacolor not being a camera calibrator, but a white balance and exposure tool: SpyderCUBE. This is a fast and easy product to shoot under differing lighting conditions, which provides white balance and exposure data for later RAW adjustment of the images. It can also be used to determine optimal camera settings on site, and to configure lighting set-ups for photo shoots were lights, reflectors, and gels are used. Photographers who integrated SpyderCube into their photo workflows found that it solved many of their color problems. But there were still color issues that were not corrected by the SpyderCUBE; issues such as different cameras providing different color flavors in the images they produced. And localized color issues such as logo colors or difficult colors which did not shoot quite as expected. These are true camera calibration issues, and SpyderCHECKR was designed specifically to deal with them. Shooting the SpyderCHECKR carefully, under controlled lighting conditions produces a camera calibration that can then be used with virtually any image shot with that camera, or that camera and lens combination, for lenses which have a visible color flavor. A photo workflow based on using SpyderCHECKR camera calibration for each camera body or body and less combination used, and SpyderCube for site lighting and exposure info produces a robust color workflow with better camera-to-camera matching, and more accurate and consistent color across the board. The learning curve to incorporate this solution into your photo workflow is short and sweet; results can be seen immediately, and soon become second nature to photographers who adopt a Spyder Capture Workflow. There is one other camera function which can be calibrated; and while it is not color related, its definitely image quality related. 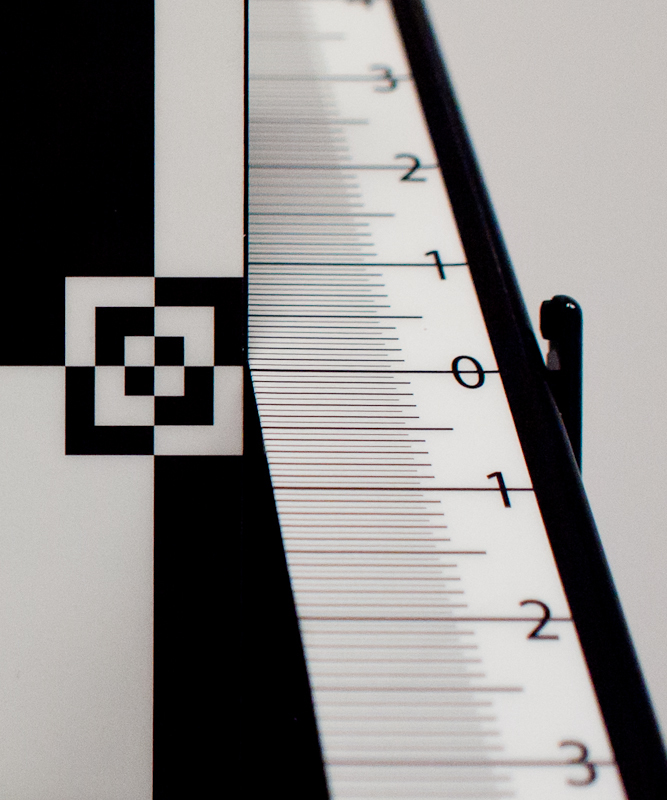 This is auto-focus calibration. Datacolor added SpyderLENSCAL to the product like to allow photographers to check the autofocus on their cameras, and as a tool for adjusting the micro-focus functions in the more recent high-end DSLR models. Since the release of SpyderLENSCAL, it has become even more useful, with some recent camera models now allowing micro-adjustment of the focus at both ends of the zoom range of zoom lenses. As auto-focus becomes more effective in newer cameras, more and more photographers are depending on auto-focus for more types of photography; not just fast action photography and photo-journalism, but glamour, fashion, street, and even architecture and landscape. The more a photographer depends on auto-focus, the more important auto-focus testing and adjustment becomes. Once photographers started using SpyderLENSCAL, they realized that it was not just useful to center a lens’s depth of focus on the focal point, but could also be used to bias the depth of field for differing types of photography. So a glamour shooter may prefer to move the focal range a bit forward, so that when the eye is in focus, the nose is also sharp, instead of the ear. A landscape photographer might prefer to do the opposite, and have the landscape behind the focal point be more in-focus than items in the foreground. And with multi-adjustment camera bodies, it is now possible to set a 70-200mm lens to front focus a bit for portraits and people shots at 70mm, but back focus a bit for landscape and street shots at 200mm; the best of both worlds in a single lens. 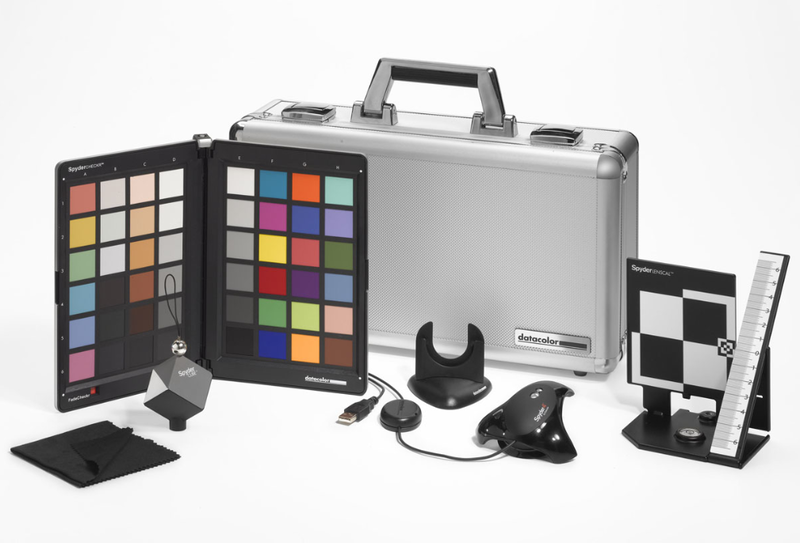 All of these Datacolor capture products have been available individually, but as interest in capture calibration has increased, more and more customers have been looking for a bundle including these product to meet their needs. So SpyderCAPTURE PRO was created, including all three of these capture products, plus Spyder4ELITE for calibration of displays, projectors, and mobile devices. This solution offers a generous price savings over individual purchase of the included products, and also includes the popular fitted metal case that has been a signature of Datacolor bundles over the years. So if you are ready to improve your capture color and sharpness, as well as trust the color you see while viewing and editing these images, Datacolor SpyderCAPTURE PRO may be just what you are looking for. Both Hasselblad and Mamiya Leaf have announced medium format cameras today at Photokina. Here are a couple of links for the Hasselblad H5D, and the Mamiya Leaf 645 DF+, for those with an interest in this category of cameras. The Hasselblad press event today was standing room only. Word is out of a new Leica S series camera, in that interesting category with a DSLR-style body but a medium format sensor, and lenses that can support that sensor size. More info should be available later in the week, for those with an interest in this rather unique type of hybrid camera.